Assetline Leasing Company Limited (ALCL) together with IDEAL Motors is offering innovative leasing solutions for the range of Mahindra four-wheelers including small commercial vehicles (SCVs), intermediate commercial vehicles (ICVs), heavy commercial vehicles (HCVs) and buses. Through a memorandum of understanding (MoU) recently signed, ALCL enables convenient financial solutions for IDEAL Motors’ customers reducing facility processing time and documentation, ensuring better customer experience and all-round service standards with innovative leasing packages. ALCL, the flagship company of DPMC Assetline Holdings (Private) Limited- a member of David Pieris Group, is a leading specialised leasing company (SLC) registered with the Central Bank of Sri Lanka. Since commencing operations in 2003, ALCL’s outreach at present extends to 52 branches located island wide, providing a wide variety of innovative products to a diverse customer base. ALCL offers bespoke lease financing for all vehicle categories with the latest being the hybrid and electric vehicle leasing. Its loans division caters to the financing requirements of individuals and the small and medium enterprises (SME) sector with financing facilities for purchase of machinery & equipment. Products include, revolving loans for financing of working capital requirements, spare parts and dealership financing, along with factoring credit to support trading businesses. Personal loans to facilitate education, marriage and purchase of consumer durables, etc. are also products that are well aligned with ALCL’s precepts of operation. ALCL recently celebrated its 15th anniversary in the leasing business offering its customers some extraordinary offers. IDEAL Motors (Pvt) Ltd. is a subsidiary of Ideal Group. Its core business interests are in Motor Franchise Imports and Motor Spare Parts in Sri Lanka. Since November 2009, IDEAL Motors has been the Sole Authorized Distributor for motor vehicles and motorcycles manufactured by Mahindra & Mahindra Company Ltd. India. 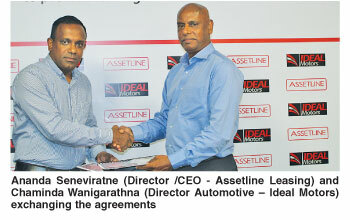 IDEAL Motors has sold over 65,000 Mahindra vehicles in Sri Lanka to-date, and has achieved a market share of over 50% in the Light Truck category, competing against major players who dominated the market for many decades.